Oat is among the most commonly used grains in the world. Oatmeal (‘rolled oats’ or ‘steel cut oats’) are one of the most common ingredients in breakfast meals such as porridge, granola and muesli. In Sweden and other Nordic countries; it has traditionally long been known & said that eating oatmeal-porridge everyday will make you strong and give you a much healthier life. Recently I started to look into scientific studies about oats and it totally blew my mind to find so much research out there that confirms the age old sayings about this grain. Let me share with you what I have found. Oats contain β-Glucans (beta-glucans), which have been shown to stimulate & strengthen the human immune-system in a few ways. Beta-glucans are found in both bacterial, fungal and yeast cell walls and have in a scientific study published in the Journal of Hematology & Oncology  been shown to initiate a strong anti-microbial immune response triggering a vast group of immune cells including macrophages, neutrophils, monocytes, natural killer cells and dendritic cells. A scientific study published in the International Journal of Biological Macromolecules have show that beta-glucans from oat have strong anti-tumor properties, and at the same time show no toxicity for normal cells . Oats also contain an antioxidant called avenanthramid, which another scientific study have shown can stop the development of colon cancer  . 3. Oatmeal effectively heal unhealthy skin conditions. A study published in the Journal of Drugs in Dermatology, shows that oatmeal formulations can effectively be used for treatments of inflammatory skin conditions such as atopic dermatitis and eczema . 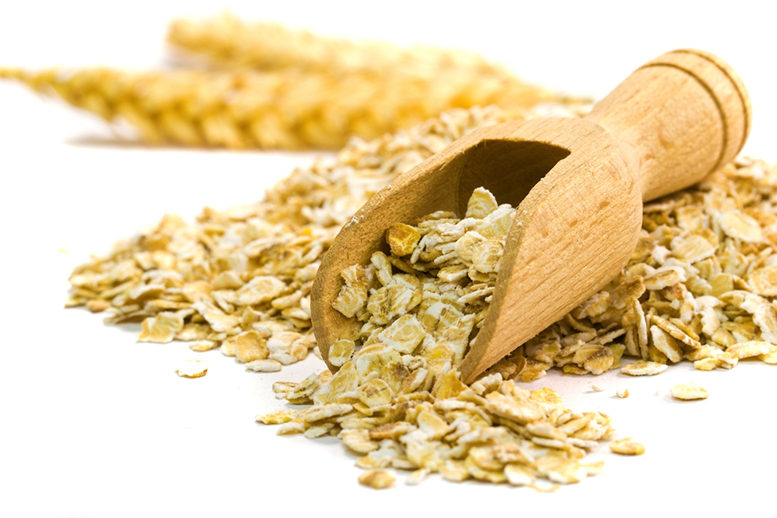 Oats are rich in fibers, and the fact that fibers stimulate better digestions is now common knowledge. A good digestion ensures that the food we eat is properly broken down into smaller molecules which can be absorbed into the blood and thereby transported to the cells in the body. So a good digestion means a better absorption of nutrients, proteins and vitamins. Fibers also prevents constipation and make you feel satisfied with the food longer (hunger control; keeps unnecessary hunger away!). Eating fibers also helps to balance the peaks and lows of the blood sugar levels, and keeps that tired feeling away. Another scientific study have shown that fibers lower cholesterol levels and help to move waste through the digestive tract  . A series of studies from Harvard University have shown that eating fibers can help to prevent the formation of blood clots that can trigger strokes and heart attacks  . Oatmeal is far superior to any other grains when it comes to the content of amino acids. The protein content of hull-less oat grain ranges from 12 to 24%, and is the the highest among other grains  ! In a study published in Journal of the American Collage of Nutrition, the effect of eating oats for breakfast was compared to the effect of eating ready-to-eat breakfast cereal. This was done by letting one group only eating oats and the other the regular breakfast cereals. The portions for both groups contained exactly 363 calories, but the result showed that those who ate the oatmeal had a much better appetite control and increased satiety  , which makes it easier for them to loose weight. Another study shows that oatmeal consumption may be for reducing the accumulation of fat by improving on the breakdown of fat on cellular level (lipid metabolism) . The last one mentioned, avenanthramides is very unique and have so far only been found in the oat grain. Avenanthramides via a scientific study been proven to stop the development of colon cancer  . 8. Oatmeal helps protect the heart and prevent cardiovascular diseases. Eating whole grains is known to significantly reduce risk of chronic disease, including cardiovascular disease. Avenanthramides from oats have in another study been shown to help prevent atherosclerosis  . 9. Oatmeal is naturally gluten-free. In 2015 a ground breaking study showed that gluten caused increased intestinal permeability, or commonly referred to as “leaky gut” . Most gluten free products sold are heavily processed and often terrible news for the digestive system. Oats on the other hand are naturally gluten free and does not need to be processed. After taking part of all this information, I see oatmeal as an amazing super food that is delicious, available all year around and highly affordable compared to many other foods. So my conclusion is that eating oats everyday is not only tasty but it does in fact make you stronger and healthier! If you have any doubts about the deliciousness oats, you may want to check out the recipe for these oat pancakes that I eat every single day. 1. The effects of beta-glucan on human immune and cancer cells. 2. Anticancer properties of low molecular weight oat beta-glucan – An in vitro study. 3. Avenanthramides inhibit proliferation of human colon cancer cell lines in vitro. 4. Colloidal oatmeal formulations and the treatment of atopic dermatitis. 5. Cholesterol-lowering effects of oat β-glucan: a meta-analysis of randomized controlled trials. 7. Wikipedia Page on Oat Protein, along with further references. 8. Lasztity, Radomir (1999). The Chemistry of Cereal Proteins. Akademiai Kiado. ISBN 978-0-8493-2763-6. 9. Acute effect of oatmeal on subjective measures of appetite and satiety compared to a ready-to-eat breakfast cereal: a randomized crossover trial. 10. Oat consumption reduced intestinal fat deposition and improved health span in Caenorhabditis elegans model. 11. Oat Antioxidants – David M. Peterson. 13. Avenanthramide, a polyphenol from oats, inhibits vascular smooth muscle cell proliferation and enhances nitric oxide production. Nie L1, Wise ML, Peterson DM, Meydani M.